They’ve been on Partisan duty in the Balkans for the last few weeks, but the Mountain Division was formed for its historical role as a supporting wave to 22nd Panzer‘s assault on Rostov in the opening phase of Fall Blau. 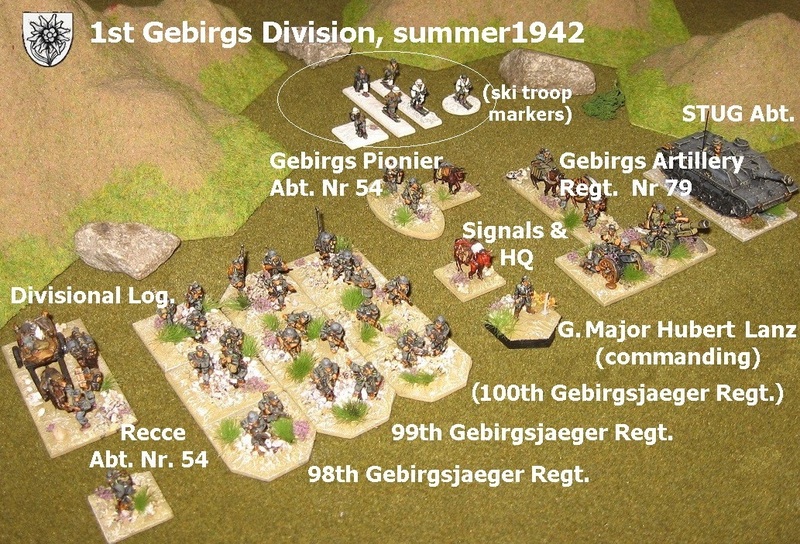 Although they had plenty of vehicles and supporting arms, the Gebirgs divisions were light divisions, and primary transport was by mule train – so I’ve chosen to make the formation up with mostly foot stands and horse or muled transport. By 1942 the third infantry regiment (Nr. 100) had been removed to form the core of a new division (5th Mountain Division) and 1st mountain Division only had 6 battalions (Regts. 98 and 99). However, the extra bases from the earlier configuration will be useful in providing additional stands for the recce battalion in Megablitz and the like. For PBI, the unit comes in at platoon strength with 3 sections plus light mortar and sniper – and the guns can take their place appropriately. Although not part of the official division, you will notice the Stug battalion in the picture which was attached to beef the division up for the city assault operation. 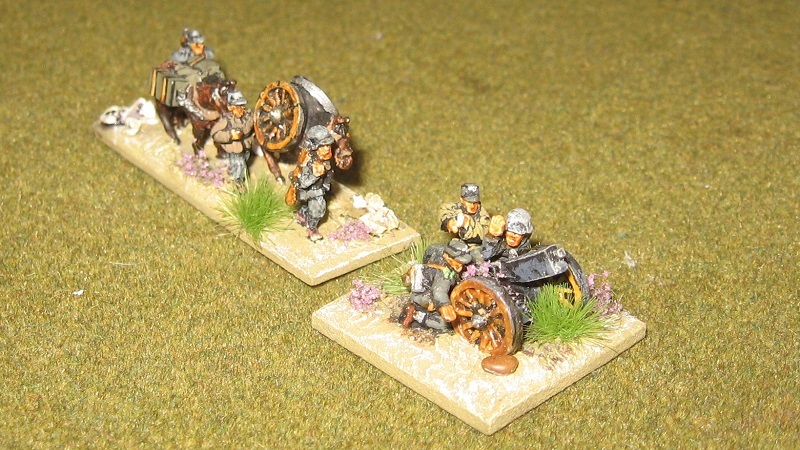 For variety, and for use when the stands get switched over for company scale use (PBI) I have given the artillery Regiment a mountain infantry gun and a mountain artillery gun. Both were commonly transported broken down into mule loads. 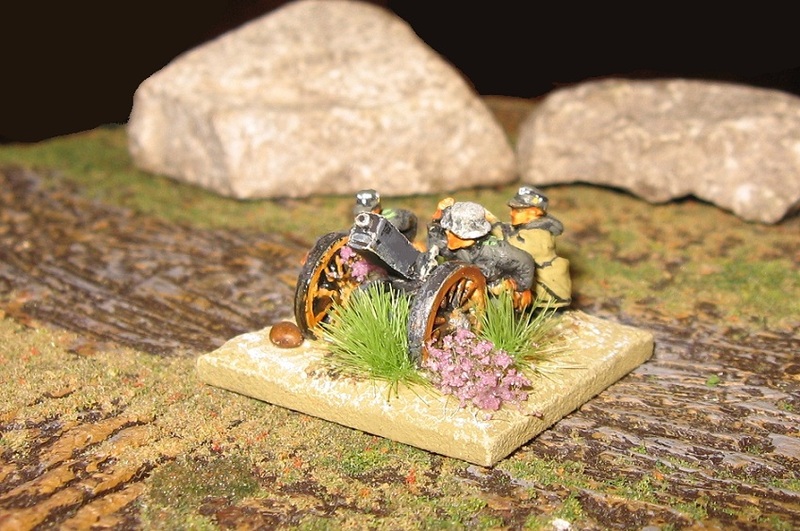 The le.GebIG 18 was the light, mountain gun version of the IG 18 with spoked wheels, no gun shield and a split trail … this one is converted from a Peter Pig model which they happily supplied with the spoked wheels (which was a start, then the knife came out) .. 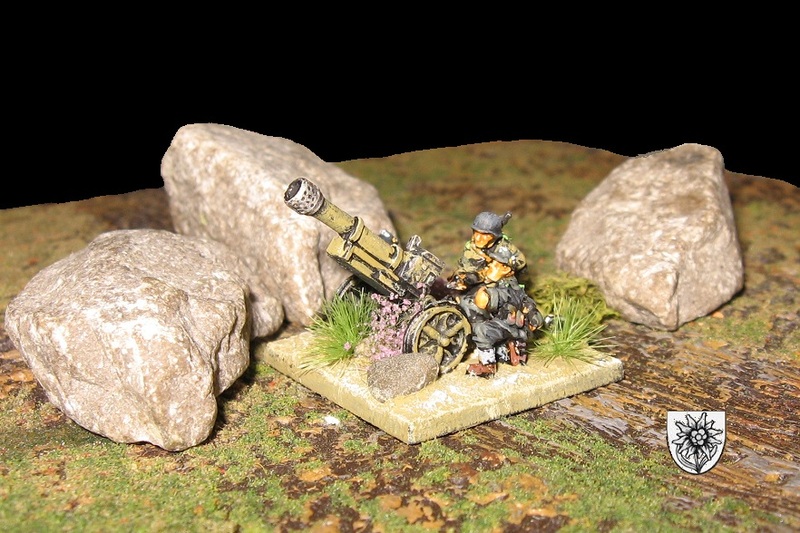 The standard mountain artillery piece was the GebG 36 75mm. 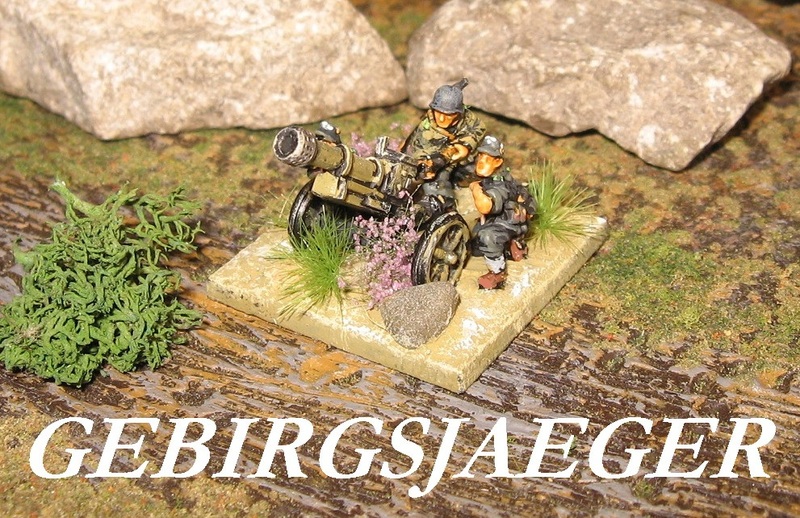 This one is by Battlefront, and you can buy them individually from the Flames of War special orders list (the service is prompt and not too expensive). I have assembled it without the gunshield supplied as most of the ones I see in photos are without. The crew is a FoW/Peter Pig mix. The whole gun is pretty chunky for a small light 75 but looks the part. Both guns can be seen in action towards the of the Wochenschau clip at the bottom of this post. 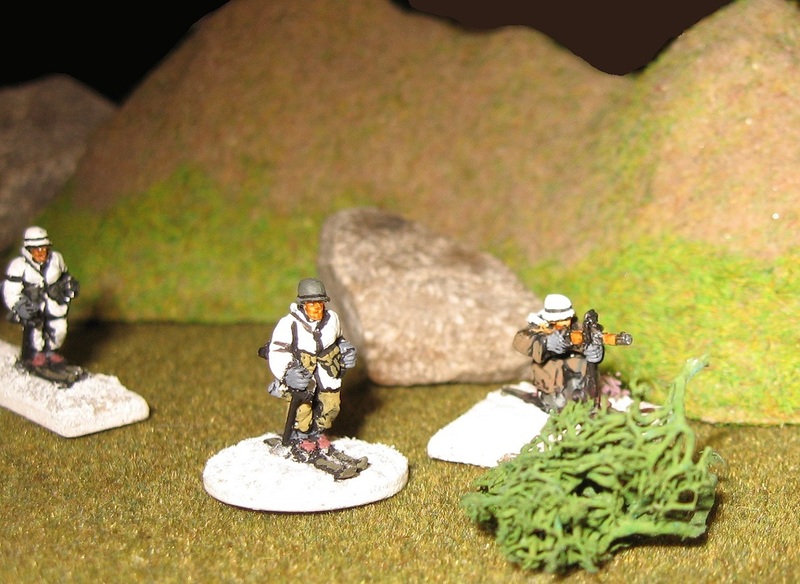 As a nod to the Alpine traditions of the Gebirgsjaeger I have decorated the bases with rocks and model railway heather … the eidelweiss would be a bit too small to show in 15mm scale but the hardy plants I can do give the troops a distinctive look I quite like. I have given a very loose indication of the eidelweiss emblem on the side of the soldiers’ caps (although I don’t really think it would be big enough to see) and where the epaulettes can be seen, I have used the light green mountain troops waffenfarbe. 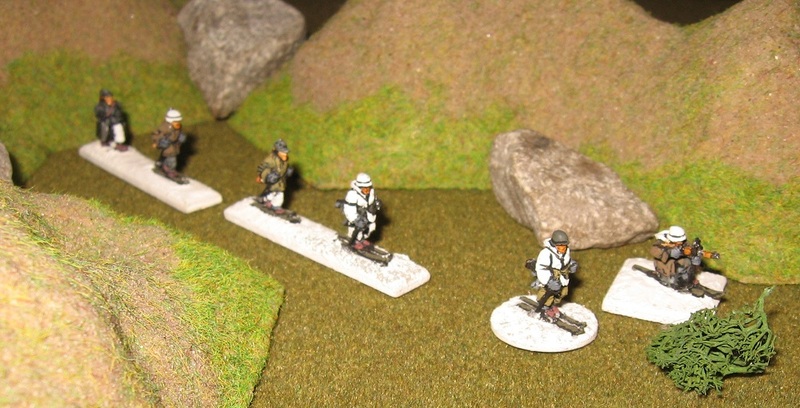 There are just a handful of markers to designate the specialist skills of these troops. 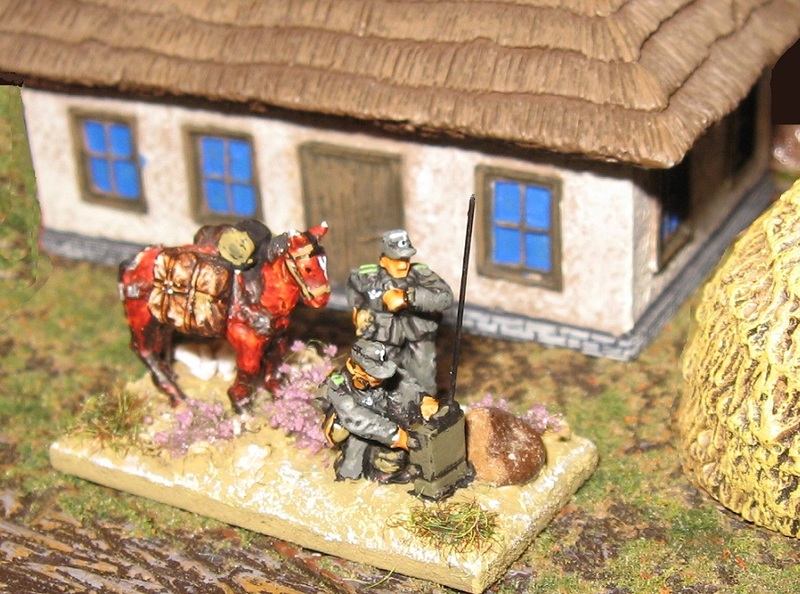 I’ve half done them envisaging players deploying them in snowy conditions from unexpected directions (‘most people can’t move but these guys can!‘) – and half just because Mr Pig makes them so how can you resist? Actually, I have removed some from their skis to use withing the foot bases (as they have nicely modelled windcheaters etc.) for a nice touch (e.g. the rearmost figure crewing the small mountain gun). 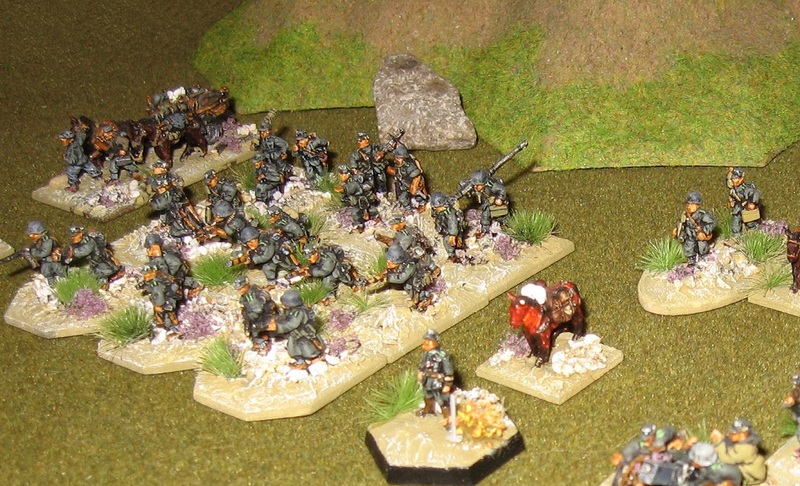 After battering their way into Rostov, the Gebirgsjaeger marched through the scorching Caucasus and into the mountains in the most southern thrust of Fall Blau. 22nd Panzer and its tanks, of course, got sent to Stalingrad. Very nice. My own GJR Division (4th) was recruited some years ago from Airfix veterans, but its been a long time since it saw action. And suddenly I then think of that ‘Heroes of Telemark’ caper, and escape and evasion in the snow – and I know there’s a game in it somewhere! Oops .. another potential project! Sorry Phil, WordPress seems to send a reciprocal notification every time that I link in to another blog. Feel free to delete the comment above and this one too.